OBAMA PENANG LAWAN OBAMA KEDAH – SIAPA GLOKAL? APA AKAN JADI DENGAN EPISOD INI? ABE NAK LIHAT CM LIM GUAN ENG PENANG NI JADI OBAMA DALAM 5 TAHUN NI. ADAKAH DIA TIDAK RACIST? ADAKAH DIA BANTU MELAYU YANG TERUK DIPULAS LINGKARAN MISKIN DI PENANG TU. CUBA LAH KE PENANG… ADE LAGI KE MELAYU YANG SURVIVAL? TAPI KALAU DI PULAU PINANG TU ADA LAH.. RAK RAK HAMBAT NYAMOK! ABE FIKIR TUN TAHU APA DIA CAKAP. TUN FIKIR 100 KE 200 TAHUN KEDEPAN. TUN BUKAN SUKA BELAKANG ATAU PANDANG BELAKANG. SAPA YANG PANTANG TENGOK BELAKANG? KALAU SUKA PULUT LEPA, MAKA PANTANG LEPA KATA KAWAN ABE BAHARIN TAHIR, PENGARAH RTM TERENGGANU 1990AN DULU. KITA LIHATLAH SEBAB TUN MASIH ADA DAN SAUDARA LEE KUAN YEW SERTA AYAHANDA LIM KIT SIANG MASIH ADA. SEJARAH TAK TIPU. KITA YANG SELALU TIPU SEJARAH. DAN TUN KATA SESIAPA YANG LUPA SEJARAH, DIA AKAN DITIPU BERULANGKALI. tok guru obama pulau melaka ke? 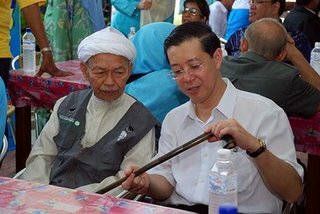 Dr Mahathir Mohamad is trapped in the past by suggesting that race-based politics is still relevant in Malaysia, said Penang Chief Minister Lim Guan Eng today. According to him, the former premier’s view on the March 8 general election was not shared by the majority Malaysians who rejected race-based politics. “Obviously some people are still stuck in the political eras of the1960s and 70s,” he told reporters at the Penang Assembly House. In his keynote address to mostly university students at a function in Putrajaya yesterday, Mahathir shot down suggestions that the last election signaled the end of race-based politics. On the contrary, he said, a close examination of Pakatan Rakyat parties, which gained big in the polls, would reveal that these parties were largely race-based. However, Lim said people like Mahathir dwell in their little world of ‘old school’ thoughts and would soon disappear under the wave of transformation sweeping across the world. He predicted that the election of Barrack Obama as the American president would break various barriers and trigger a global transformation. The Pakatan Rakyat said Americans have broken their racial, religious, culture, traditional and historical barriers to elect a ‘son of a slave to become the president of a super power’. “Just imagine a black man living in the White House. Americans have chosen a president based on principles and character not the colour of his skin. “The American transformation is sure to affect other countries,” he said, calling on senior politicians like Mahathir to move forward with time. The DAP secretary-general also questioned the logic of deliberating on racial and religious politics as well as supremacy of a race when political governance failed to address various pressing public issues such as poverty, justice and freedom. He noted that poverty in Terengganu was prevalent although political parties in the state promote racial and religious politics. “The hut I saw 20 years ago is still there when I visited the state recently. Has racial politics resolved the issues of poverty and cater to public needs? “After all, Terengganu is made up of 90 percent Malays,” he said.